First of all I wanted to say thank you for all the comments, tweets, and emails that you guys sent my way yesterday. I tried to get back to everyone, but some of you are set up as a no-reply blogger and I couldn't respond to your comment. If it weren't for you, coming here, taking time to actually read what I write and then leaving a genuine message, I would have quit months ago. Speaking of the word quit, that has been on my mind lately when it comes to blogging. I am pretty positive we have all felt this way at least once. Now, don't get me wrong, starting my blog has been one of the most fulfilling and rewarding things I have ever done in my life. I have said it a dozen times in previous posts. I have grown extraordinarily as a person and it has taught me valuable life lessons, ones that took me thirty-plus years to figure out. It's my creative outlet, but this outlet also comes with hard work, dedication, perseverance, long hours, self comparison, becoming burnt out at times and feeling inferior. What I have had to remind myself is that the pluses have by far outnumbered the minuses. I mean, hello?! A simple girl was swooped off Texas soil and whisked away to London because of this blog. (Thank you, Wallis). I can't leave out the fact that I met and became in real life friends with girls because of this blog. I could bore you to tears with all the stories and highlights that have come from my little space in blog land, but I won't. What I will share with you is my knack for quitting. Since I was a little girl, I have always considered myself a quitter. I would start something and never finish it; dance class, a plethora of sports and jobs. Plain and simple. I would quit if it was too hard, got boring, thought my ego would get bruised or out of pure laziness. This syndrome trickled into my adulthood as well. After beating myself up one afternoon, pondering my self-professed quitter syndrome, something hit me. I actually believe that the smack to my head came from a higher being. All of the sudden I was instantly reminded of all the things that I haven't given up on. Things that actually matter. Pieces of my life that are more important than any sport, career or activity. I could have easily thrown in the towel on my marriage when we hit rough patches, family when they told me things I didn't necessarily want to hear, faith when it was tested, college degree and friendships that got rocky. I won't ever give up on what matters most. So many things in life come and go, but family, genuine friendships, life lessons and achievements are here to stay, as long as you pause and realize their importance. Even though there are days when I want to quit my blog because I think it's become too much work, that I am not good enough, wonder where it's really going or if I am wasting my time, I know that if I walked away from this, my own special place, I would regret it all my days. It has become one of my greatest personal achievements. Everything and anything you are passionate about takes time to develop, curate, grow and requires dedication, courage and commitment. There are not too many people in this world that have it easy or been given free handouts served on a silver plated platter. Most of us have to put in the time and effort toward the things that mean the most to us. And yes, this blog of mine means a great deal to me. Maybe in five or ten years, or quite possibly next year, I may not continue with what I am currently doing, but if and when I stop it will not because it got too hard, stressful or out of laziness. To make a long story short, whatever it is you are passionate about, believe in or are striving for, don't let your past predict your future. The present is here and now, do what you love, love what you do and just because you may walk away from certain things doesn't make you a quitter. It's just setting you up for your life's next adventure and making you all the wiser in your choices and decisions. Just make sure you are doing the things you are doing for the right reasons. Life is short, people. P.S. I know that my outfit had absolutely nothing to do with my content today. I love this kimono and wanted to share how I styled it. Sorry if you thought the photos and my ramblings were supposed to mesh somehow. I like to refer to these kinds of posts as having "blogger brain". I hope you enjoyed it regardless. Moving onto photos and words that do relate, I am thrilled to share a blogging fashionista with you. Her name is Lauren with Fizz and Frosting. Lauren and I have so much in common it's scary. We both run a style blog. Clue number why I love her. She is bargain shopping babe and is a master hunter when it comes to finding fab pieces for less. Lauren drinks wine. Hello? So do I. She is a mom. So am I! Okay, maybe she doesn't actually have children, but does have sweet furbabies to take care of. Back to strictly talking about Lauren. She nailed it with the monochromatic look, and even taught us an optical illusion with that post. Need ideas for work wear attire? She has you covered with this one. I am still obsessing over that leopard top. She gets crazy creative with remixing her wardrobe and is constantly giving us tips on how to take one piece and style it a completely different way. And did you know that neon can actually be subtle? Well, Lauren shows us how to make it happen and even wear it to the office. In case I wasn't clear, Fizz and Frosting should get added to your blog roll if you are looking for fun, practical, trendy and affordable ways to work your closet. See you at her place. Today, Lauren is offering a $25 gift card to Old Navy, Gap or Banana Republic. The winner can use the gift card to any of the three stores. Make sure to stop by Fizz.and Frosting and tell Lauren thank you! Loving your Kimono whether it relates to your written word or not! For the record, glad you have never quit, and thanks for sharing your story with us! And I don't just mean today! Keep up the great work and keep working those outfits that look better on you than the youngins! Glad to hear that you aren't a quitter. Great story! Thanks for sharing. :-) Cute shoes btw. Blogging can be really owerwhelming sometimes and it's a really hard work 24/7!!!! Your blog is amazing and I'm glad you never gave up on it!!!!! I see an excitement and love in every single post here, so isn't it the most important thing- love what you do ? First off, great outfit! And secondly, so glad you didn't quit! I think we all have those burn out moments with blogging. I haven't been blogging for long and don't have too many followers but what I've gained from it has been totally unexpected and make all the hours spend on the computer totally worth it. Oh yes. Blogging has enriched my life in so many ways. I've both grown personal-wise, as well as skill-wise. First, that kimono and that red on you is gorgeous!! Love it! Second, we have all felt this way about blogging and sometimes I feel like a quitter too. I read your blog because we seem so similar and yet reading you always makes me want to elevate beyond what I'm doing and I've been going a long time. You inspire me beyond what to wear and I love your words. I read recently that it is the person that lets go and doesn't care as much that is the one who gets what they want. Basically telling us to stop spinning our wheels and worrying about reaching that goal. It will come if we just relax. Not sure if it is applies but it helped me to focus more on what is important and let go of the feelings of "I'm not good enough, I'm not where I should be.."
Absolutely....don't let your past predict your future. And I totally agree about this whole blogging thing..it's a creative outlet that I really need right now. Maybe it won't be in 10 years...but right now, definitely! I'm so glad you're not quitting. I don't comment often, but I love your style and your sense of humor. You're a beautiful person inside and out! That kimono is GORGEOUS!! I hear you on the quitting thing. The nights when I get home and I don't have the time I want/need to work on my blog, I think about throwing in the towel. But, I would miss it SO much! It really has enriched my life in ways I didn't think possible. I love the kimono and whole outfit! I am glad you didn't quit blogging and I understand how you feel! I find sometimes it may be easier to quit but I keep going. Such a pretty outfit! I adore your pretty blonde hair! :) Very nice! LOVE the kimono & love your blog! If you ever get ova-whelmed, just call me and we can pound down a couple margs...and you won't want to quit anymore :) Love you! You look GORGEOUS in red. People who don't have their own blogs don't understand how much work it is! So glad you haven't quit! Ohhhh I could go on for days about the things I should have quit but didn't... the list of things I shouldn't have quit but did is thankfully much shorter, but I'm not sure which is worse ;) P.S. IF YOU QUIT BLOGGING I'LL CRY. those shoes are to die!!!! I missed yesterday, I will go back and read it. But even without it, I know we all feel just wrung out somedays, and wanting to quit whatever it is that's making us feel like that. When it happens to me I take a big breath and just be for a while, and reconsider whatever it is in eight or ten hours. Totally love your kimono! I can't even tell you how stressed out I am getting thinking about going back to work and managing my blog...it is just so much to handle! I love love the necklace! Gosh I hate that it is sold out!! Well this sure hits home. I, too, have been a pretty big quitter throughout my life... which is why I'm still shocked to be so passionate about my blog. You're right though, some days it's HARD to keep going. I'd be sad if you quit... so don't. K? I think all of us bloggers struggle with that every now and then. It seems like I have taken on so much now. I don't know what I did with my time before my kids. I must have just sat around all day on the couch! Now my schedule is so crammed. I can totally relate to this post. Keep at it girl. Blogging can be so overwhelming, can't it?! I definitely wonder sometimes why I'm still doing it, and suffer from feelings of doubt and inferiority, but the good definitely outweighs the bad! Keep up that sunny attitude! My day would not be the same without a visit to your blog! loving this outfit on you!! so gorgeous!! and i know how you feel, sometimes when i feel unmotivated to blog, i feel like quitting, but something keeps drawing me back LOL! I totally needed this today! Thank you!! I've been questioning what I am doing with the blog and where I see it going. Is it all worth it? The answer is yes, but it's so hard to remind yourself of that sometimes. Everything you wrote in this post I agree with and is me to a tee. I've taken a couple of days "off" from blogging, because I've been busy and tired and without good ideas. I've learned over the past few months to not let myself stress about not posting. If I can't, I can't. That's ok. It's supposed to be fun, and as soon as it gets stressful, it's not fun anymore. I really needed this boost of motivation and confidence today! xoxo. Awwww that's quite a post Shanna...honest & so fresh! Yes moments like that comes to any blogger I think but you really should be counting your lucky stars for having such a wonderful life & blog! We will be rooting for you not to quit anytime!! Thanks for sharing your story. I've always felt like a quitter too but you just gave me some perspective. I only quit those things because they never really mattered anyway. I'm so glad you keep on keeping on with the blog! It's so hard to stay positive and passionate about things sometimes. i struggle with that all the time. love your view on this today! and i ADORE your blog. seriously one of my absolute favorite reads and a never miss. I LOVE this kimono, I am truly obsessed with them right now, so chic and comfy! Great tassel necklace too! I love this kno on even more than the last! Love he pretty red. And you're right. Sometimes we get lazy but it is worth it and you should be so proud of yourself!! Love Lauren too! I love kimono jackets! This one is adorable the colors and pattern are gorgeous. I've bee on the hunt for a tassel necklace! It looks great with your outfit girly! I almost got scared when I read your post's title. Nooo don't quit! Sometimes I have had those feelings too. In fact, I put myself through a grueling two years of being a biology/pre-dentistry major because I "didn't want to quit yet another thing." Thankfully I got a knock upside the head and changed majors to music. Best thing I ever did. I also sometimes think about quitting blogging, but I think "this is actually helping me document my life." Don't throw in the towel. We love you! Im linking up for the first time today :) I already follow you on Instagram and love your blog! Happy hump day! I'm so glad you love this, have found something you are passionate about and have no plans of quitting any time soon! My blog is on much smaller scale and while sometimes I compare myself to the big blogs and feel inferior on some levels I kind of like it that way because it means that I'm less likely to burn myself out on it. I think your blog is great and I totally agree that it's worth it as long as you are doing it for the right reasons. Your the cutest. I ADORE that kimono!!! Also, I adore your black shirt. I am on the search for the perfect black shirt... where did you get that one? You already know how I feel about you quitting. Giiirl you must be reading my mind! I have felt uninspired and kinda blah lately and waiting for something to knock me upside the head. I love your honesty and your blog (duh) and think you do a great job day in and day out. I think we all get in ruts and sometimes, it takes that big smack on the head to get us back on track. Now could you send one my way please?! It always shocks me to hear the bloggers that I look up to and aspire to be as successful as (that's you, my dear!) say that they have insecurities when it comes to blogging. Keep rocking because you're giving me tons of inspiration on the daily!! Don't ever quit blogging, Miss Shanna! Then I would have to find another fashion resource to stalk :) And you ARE good, you really are. Quitting has been on my mind A LOT lately, probably too much so I am thankful that you posted this, I am. LOVE YOU! I love you so much and i am so proud of you for real sticking to this. You are an inspiration to me daily. You know how I feel about the blog land, but today I just wanted to say, great job Shan! I would miss you if you quit. Sometimes quitting seems so easy and like the best answer, but a lot of times it is harder than sticking with something. Think of how hard it would be to date again, co-parent, express yourself, connect with people who have similar interests, etc. Love this, and you! I know how much time this takes....and it can often be overwhelming....,but I feel like there are reasons we were all lead to start blogging.....right??? I definitely relate to your post about quitting. I've never been able to keep up a diary, and have started so many projects and then interest and passion fade away, but my blog has also kept me going, even though I've thought of quitting oh so many times. Good for you! And as for your outfit - seriously, I want.It.ALL. NOW. Totes fab, really, go you. You nailed it in this one. I think the most important things in life are worth fighting for, mainly family and marriage...but so are the things that help sustain US as people. And "silly" or not, our blogs make us happy and fulfill something within us, right? Love this look!! I've got to get a kimono or two!! First of all I am so happy you're not a quitter! And second of all, I want your kimono! 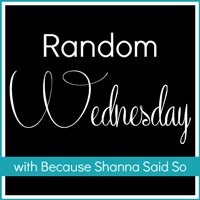 this post is reason #48290830183 why i love your blog and love your heart, shanna! Thanks for the reminder about passion and quitting. I haven't been blogging much lately, but mostly because my life is out of control crazy! I have been taking pictures and I have plenty of stories to share. I've thought about quitting, but I know I don't really want to. I think I just need some time to catch up...and maybe a new header to spice things up! I love that kimono! First time I missed the link up and I was a little sad...so I had to come drool over your outfit. That necklace! You look amazing as usual...obsessed with that necklace!! Don't quit...love reading your blog! I've felt the same way about quitting blogging lately.. life is tough right now which is why I haven't been posting much. But I LOVE it and it's the only thing I've ever stuck with! I need to get back to it. And I LOVE that kimono. So pretty on you! Im new to blogging and I feel this way most of the time. I hope my blog grows a bit so I could at least start feeling that its worth something. I love reading your blog and you are so inspirational. It seems no matter big or small a blog gets these feelings are valid to each one of us. Thanks for saying these words out loud it keeps us all motivated. BTW back to the outfit the kimono is so pretty. Makes the simple casual outfit more interesting. What a fabulous kimono! I recently saw Danielle LaPorte speak and she was wearing a kimono cardigan as well -- love!